CNG: eAuction 438. EASTERN EUROPE, Imitations of Roman Republican. Eravisci. Mid-late 1st century BC. AR Denarius (18mm, 3.20 g, 5h). Imitating various obverses and Cn. Lentulus reverse. 438, Lot: 284. Estimate $150. Sold for $100. This amount does not include the buyer’s fee. EASTERN EUROPE, Imitations of Roman Republican. Eravisci. Mid-late 1st century BC. AR Denarius (18mm, 3.20 g, 5h). Imitating various obverses and Cn. 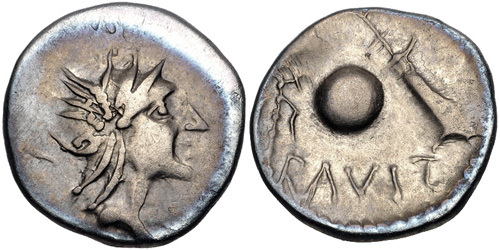 Lentulus reverse. Helmeted head of Roma right / Globe between rudder and thunderbolt. Freeman dies 5/B; KMW 1557. VF, toned.